The focus of our lab is the development of photocatalytic methodology for asymmetric synthesis using visible light. Photochemical synthetic methods provide a complementary approach to traditional methods because the substrate’s primary reactivity occurs from its excited state rather than its ground state. My project explores photochemical rearrangements as a method to rapidly build fused cyclopentanes from simple starting materials. Using mild visible light irradiation, these rearrangements can tolerate substrates with photosensitive functional groups, allowing for further synthetic functionalization. I’m really excited to be exploring such unique photochemical reactions, and hopefully I’ll be able to share a paper with you fairly soon! How did you decide to come to UK? UK was actually the only place I applied when considering universities. Both of my older brothers attended UK, and I always enjoyed Lexington and the campus when I visited. I made my college decision pretty simple! Your started out wanting to be a dentist. Could you tell us at what point you knew chemistry grad school was the right choice for you? I wish there was a single moment when I decided on grad school; rather, it took several years before realizing graduate research was right for me. I was attracted toward dentistry due to the possibilities for joining a practice or teaching. During my freshman year, I enjoyed my first organic chemistry course, and I wanted to get involved with a synthetic research project. During my first year in a chemistry research lab, I learned synthetic chemistry was far more complex than a typical lecture course could portray. During my junior year, I started shadowing dental students in the UK dental clinic. While this was interesting in its own ways, I found I missed being in the chemistry lab. Rather than being engaged with the dental students, I would be thinking of the next reactions I wanted to set up in lab. When I noticed this trend, I decided to go all in for grad school. I’ll make a plug here for Research Experiences for Undergraduates (REU) programs. These were also pivotal experiences for me in pursuing a graduate degree in chemistry. In my first REU at Penn State, I learned research was something I could seriously consider for my future. In my second REU in Glasgow, Scotland, I gained the confidence in (and out of) lab I needed to make the leap into a career in chemistry. What course or courses were the most useful or interesting? I found CHE 532 (spectroscopic identification of organic molecules) to be the most useful and CHE 547 (quantum) to be the most interesting. I rely on skills I learned in CHE 532 every day in grad school, and I’ve built on this core knowledge with my graduate coursework. CHE 547 covered quite abstract topics in my opinion, so I approached it like a math exercise. Conceptually, quantum was one of the most interesting and challenging courses for me. In terms of learning lab skills, CHE 533 (organic analysis lab) gave me practice in graduate level research techniques. This course was indispensable for transitioning into grad school. How did research affect your outlook on the chemical sciences? 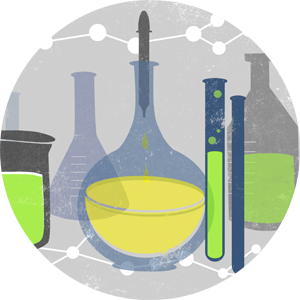 There are aspects of chemical sciences that are learned in a research setting, not a classroom. I feel lucky to learn these lessons early in my undergraduate experience. Research taught me that big scientific progress takes small steps at a time. Plus, celebrating the small successes in lab is important, because there are many days when research simply doesn’t work how you hoped. Now that you're a few years into grad school, what advice that you have to UK undergrads considering this option? It’s totally worth it. So far, graduate research is one of my most challenging yet most rewarding scientific experiences. Talk with your TAs and ask them about grad school. Ask your professors what grad school was like for them. Seek out research labs on campus and apply for REU programs. During grad school, a lot of days are pretty tough, especially at the beginning. Often times experiments don’t work. A set of failed experiments does not reflect your ability to perform chemistry. Do not associate your self-worth with the success of your research project. Persevere through, and the days when you finally synthesize that compound will make all your work worthwhile. If you’re considering graduate research, this is an exciting time for you! Explore your research interests and keep an open mind. What you find may surprise you. Once you start graduate research, much of your learning becomes independent. An important thing that helps me grow as a researcher and a scientist is allotting the time to reflect on my experimental designs, possible outcomes, and to reflect on what my data is trying to tell me. Good luck future scientists!